Winter has been hard and we are in need of funds to keep the horses in shape. 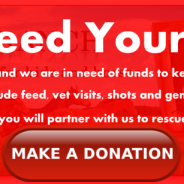 Some of the expenses include feed, vet visits, shots and general upkeep of the ranch. We hope that you will partner with us to rescue these horses. Charis Youth Ranch’s mission is to rescue, rehabilitate and sanctuary retired racehorses by transitioning them from a life of racing into new careers or providing sanctuary for life. Additionally, we endeavor to connect youth from all walks of life with these rescued horses to learn unconditional love and trust, which facilitates healing for both equine and child.